I have had this little used low pressure Mercury spectral lamp for years. It would not start on the normal ballast circuit when I tried to use it at a demonstration. There are no visible marks/ cracks in either the outer or inner envelopes. I wonder if it has lost a starter gas. I can light it with 1.5kV and it will remain lit until 325V, but no chance of starting it with the normal leak ballast or even an ignitor. I can’t think of any other reason for the failure other than absorbed or escaped starter gas. The mercury spectral lines are still present when it runs. May be a lesson on running lamps now and again. Air poisoning or manufacturing defect? It was working fine 20 years ago, and the spectrum looks like mercury when started. If air has got in there's not much. In fluorescent lamps, air poisoning causes the lamps to go a dim red or pink color, which consists of dim mercury lines and moleculus O2 and N2 bands. It is also possible that this lamp went mercury starved. Try heating it in the oven. I did that and it revived a cycling 100w HPS lamp. 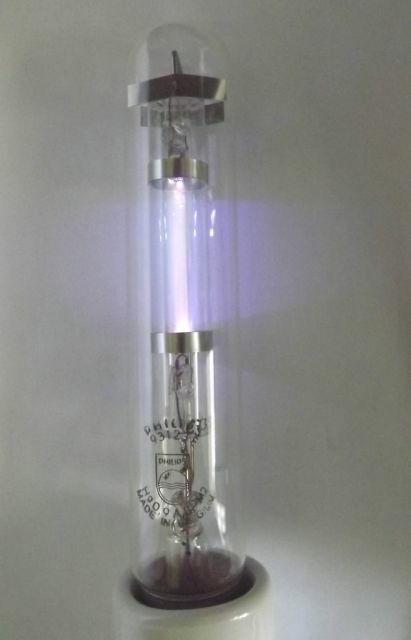 also if this lamp is a Low Pressure Mercury Lamp it only going to give 75 Lumens, where the High Pressure Version gives 3800 Lumens, you can try lighting this on a European 70w HPS/Metal Halide Ballast and 2 wire Ignitor such as the Philips SI51 failing this a set of 90w SOX Gear. These lamps may suffer from bad end seals or the gas runaway effect that Lps lamps undergo after some time. I tried it on both a 90W SOX ballast as standard then with a 2 wire SON ignitor to no avail. It would light on a NST but the current was too low. I decided to heat it gently on a Variac controlled and resistive ballasted MOT . The resistor ballast burnt out quite quickly and no improvement was made to the lamp. Perhaps the lamp is mercury starved although a small amount is visible condensed behind one cathode. Are those escaped mercury droplets down toward the bottom of the stem press? The mercury appears not to have escaped just condensed behind the electrode, but there is not much, so starvation may be the issue.